Sometimes, less is more. 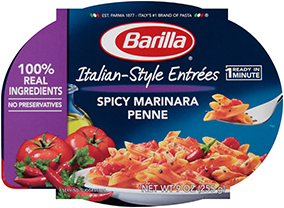 This week’s National Sauce Month recipe is a simple, yet flavorful Barilla® Collezione Spaghetti dish centered around Italian San Marzano Tomatoes. Garlic, capers, Calabrian peppers and fresh oregano come together for unforgettable flavor. 1. Bring one large pot of water to a boil, season with salt. 2. Meanwhile, sauté garlic and capers in 2 tbsp of extra virgin olive oil for one minute, until slightly yellow. 3. Next, add Calabrian pepper and 1/2 tsp oregano, and sauté for one minute. Then stir in crushed peeled tomatoes and salt, simmer. 4. While sauce is simmering, cook spaghetti according to package directions. 5. Drain spaghetti, toss with sauce and stir in remaining extra virgin olive oil, oregano. Top with cheese before serving.